I have lost the heirloom christening gown! It's a beautiful ivory antique from England, a gift from my aunt. When we moved here, I packed it in an archival box and placed it within a sealed plastic tub in the attic. The archival box is now nowhere to be found! 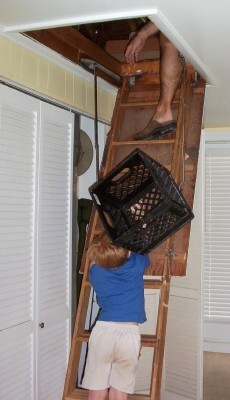 I would have looked earlier, but I had orders not to climb the rickety pull-down stairs until after I had the baby. In the meantime, we culled through a ton of stuff we no longer need and are selling it on Craig's List. It must be 100 degrees up in the attic! It's hard to see the silver lining when showers of sweat are dripping from your brow. Baptisms aren't fashion shows, but the details--like a gown with history and sentiment--really matter to me. If I were a better seamstress, I'd whip up my own heirloom gown using fabric from my wedding dress. But with only two weeks left, that's a sure recipe for disaster! Update: the gown was found in a box within another box...several months after the baptism. Meredith - I'll be praying that you find it because I know I would be heartbroken over losing ours. We actually do baby dedications instead of christenings, but my grandmother made me a christening gown for my first baby anyway just because I wanted one:) (Most babies just wear a pretty dress or little suit) at our church. It IS made from my leftover wedding gown fabric and so far all three babies have worn it. I'm so with you about the tradition of it all, so I'll be praying! Meredith-just said a prayer to St. Anthony for you! Hope you find it! I'll say a little prayer for you too, Meredith. My children wore the same Baptism gown that my husband, all eight of his brothers and sisters, and most of their cousins wore as well. It's a special thing! I will say a prayer for you- I really hope you find it. It is such a sickening feeling when you can't find a treasured & important item. Let us know how it goes! I sure hope you find it! Me--I took off my engagement ring when my fingers got too fat for it with baby #4. I hid it somewhere because we were in the process of moving, and I didn't want some mover opening my jewelry box. That was 16 years ago. I haven't seen it since. Damn, I wish I'd put it in a nice box like your Christening gown. At least you know what to look for. I can't even remember where I hid the ring--except I think it's up in the attic, too! Well...GOOD LUCK! My husband's parents had an heirloom gown like that. Somewhere between when him, his sister, and his cousin, and a younger cousin, the gown went missing, never to be seen again. Personally, I blame the brownies. Oh, I pray you find it! We do not have an heirloom gown in our family, but I wish we did. We purchased Tom's baptism suit new for him, but it is still very special.